Linking together all six ports and the beaches of the Heart of the Bay, this footpath follows the area’s coastline. Stretching from the beautiful villas of Taussat-Les-Bains in the north to the port of Biganos in the south, it is considered a secondary trail of the Way of Saint James. On foot or by bike, enjoy the spectacular views from here, where a remarkable architectural heritage mingles with memorable natural settings. This green lung of the Heart of the Bay was shaped by man to serve the region’s historical economic activities before becoming a Sensitive Natural Zone. 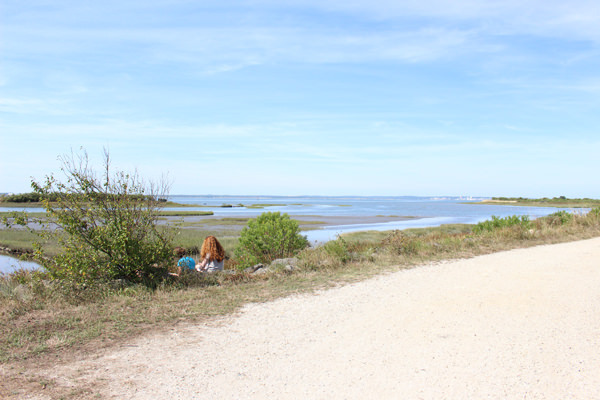 Owned by the Conservatoire du littoral, it is managed by the Conseil Départemental which offers visitors free tours in the company of a naturalist guide. As you stroll along, listen to the birds twittering in the brush, admire the flight of migrating birds, and contemplate the landscape awash in the surf. A secondary path of the Way of Saint James crosses through the Heart of the Bay. This “English path” – for it is also called “la voie des anglais” – is principally used by pilgrims travelling south from northern Europe. From Lanton to Teich – dotted with a 12th-century church, priory and miraculous fountain –, you, too, can set out on the Way of Saint James, along the bike paths and bucolic, well-marked footpaths.